Whether you're wrapping yourself up in a warm sweater during a cold winter or slipping on a lighter sweater for a cool summer night, wrinkles are the last thing you want on your cozy top. Sweaters wrinkle easily because many of them are made with delicate fabrics that are air-dry or dry clean only. The best way to remove those unwanted wrinkles will depend on the fabric and severity of wrinkles. Turn a shower on with the water at a hot setting. Shower steam is a no-fuss way to iron out some garments, but it won't work on every sweater. Shower steam usually works best on sweaters that are slightly to moderately wrinkled. Hang the sweater near the running water, and close the bathroom door to allow the room to fill with steam. Check the sweater after 10 minutes. If the sweater is mostly smooth, run your hand over the garment to finish the process. Leave the sweater in the steamy room if the sweater is still wrinkled and check again after an additional 10 minutes. Plug in and power on a steaming device such as a hand-held fabric steamer or a steamer with an arm attachment filled with clean, filtered water. Hang the sweater where you can easily reach it to steam. Press the steamer head onto the bottom of the fabric and slowly move the steamer up to the top of the sweater. As the steam rises, the inside and outside of the sweater will begin to smooth out. Remove the steaming device from the sweater and carefully even out the sweater with your hand. Turn the sweater inside out and lay on a clean, flat surface. Place a damp, white cloth atop the sweater. The cloth acts as a protective barrier between the delicate fabric of the sweater and the heat of the iron. If you're sweater is acrylic, use only a dry cloth. Turn the iron to the proper setting for your fabric. Use steam or medium heat for wool and cashmere, and use the cool setting for acrylic. Press the iron gently on to the fabric. 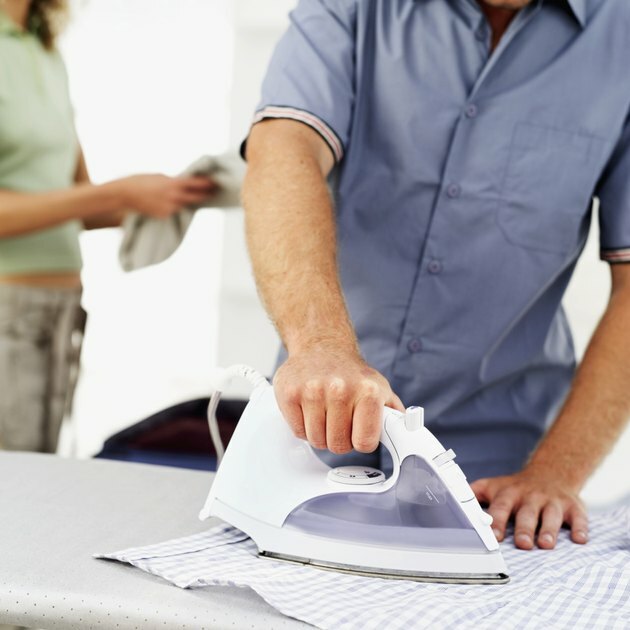 Lift and lower the iron; don't slide it back and forth on the fabric. For a sweater that is dryer-safe, mist it with water and then toss it into the dryer on a low setting to remove wrinkles. To prevent wrinkles from the start, untangle your clothes as you remove them from the washer, and don't over-stuff your dryer. Check the sweater's fabric care tag before laundering and removing wrinkles to prevent damage.